Relax and enjoy the excitement of Alii Drive from our spacious second floor unit! We have provided all the comforts of home, including a nine foot sectional sofa and memory foam mattresses in the master bedroom and guest bedroom. The dining area has great views, and there is nothing quite as refreshing as a cup of Kona coffee on the lanai in the morning. You’ll find everything you need in our well equipped kitchen, including a wok and rice cooker. We just completed a full renovation including all new stainless steel appliances and Silestone quartz countertops. When you don’t feel like cooking, you are less than a mile from fine restaurants, night life, shopping and sightseeing. After a day of sun and surf,shopping or sightseeing, head home to watch a spectacular sunset from our lanai. For entertainment we provide a state of art 42” HD LCD TV with internet apps like Netflix, Facebook and Twitter. We have broadband internet access and a secure wireless network with a wireless printer. Send the day's pics and videos back home in a flash! There is also a bluRay DVD player and a small collection of DVD’s. A smaller version of the same TV is in the master bedroom. The long and short of it is we want you to enjoy our Big Island home as much as we do! Please note that our owner association rules only permit us to rent for a minimum of one month. We met and were married in Hawaii over 40 years ago. After raising our four sons we have been frequent visitors to the islands and have long dreamed of owning property in Hawaii. We live on the east coast a stone's throw from Gloucester Harbor - the oldest commercial fishing harbor in the US. Our plan is to eventually spend our winters in Hawaii and summers in Massachusetts. Several years ago we spent a month in Kona on Alii Drive. 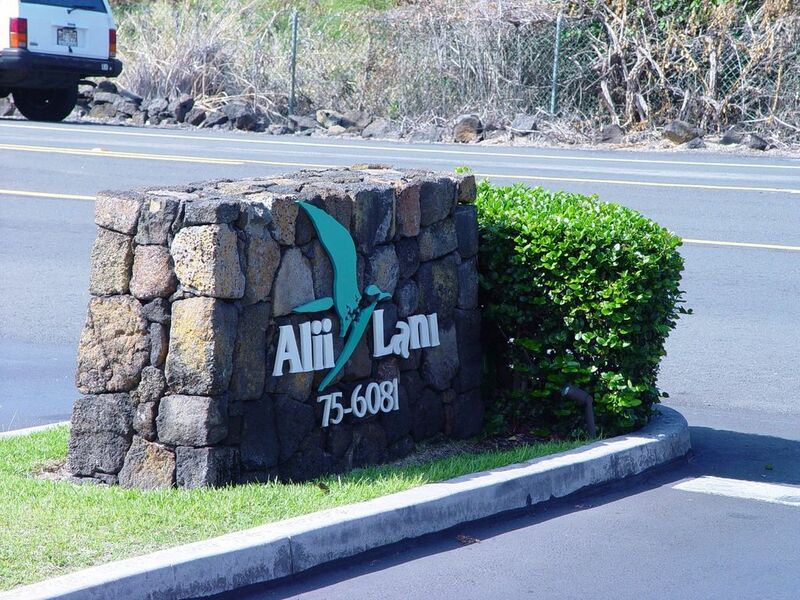 We walked past Alii Lani many times and admired the look and feel of the property - the buildings are attractive, the grounds are beautiful, and the location is perfect. When we made the decision to buy Alii Lani was number one on our list. Alii Lani is our second home - we spend 4 months a year in Hawaii. We have tried to anticipate all the needs of our guests so that they feel at home immediately. We have a very complete library of guides and resources. All your needs for relaxing on the wonderful beaches are provided so you are ready to head out in comfort without heading to Walmart. Our unit is approximately 150 yards from the shore which can be accessed from across Alii Drive. Lanai affords view of Alii Drive, ocean, and sunsets. We stayed here during our visit to Hawaii for my husband to compete in the Ironman World champs. It was a sensational place to stay for our family of 4, as it was slightly removed from the chaos of "town" but still close by and central to everything we wanted to do. The house had everything we needed and more and really felt like home by the end. It became our little slice of homely paradise that we really enjoyed coming home to after big days exploring the island or lazy days enjoying the close by ocean pool or the beach. Last days in the condo and we've enjoyed our stay. Already wrote about our stay in your guest comment book in your condo. Close to town and our favorite snorkeling bay. We have visited the island on several occasions in the past and this has become our favorite place to stay. Visited points all over the island and always enjoy all the sights. Volcano, lava tube, Hilo, waterfalls, Parker Ranch, the beaches and everything in between. The condo was comfortable and everything we needed in the kitchen was there. Beds were comfortable and a number of beach items were in the closet for use. The condo faces the roadway but the upside is the fact we had a partial view of the ocean. We live in Southern California so Hawaiian traffic passing by the condo was a fraction of what we're used to so passing cars were never an annoyance. Again we've enjoyed our stay and we're already talking of our return trip in a couple of years as we're committed to an Alaskan trip next year. A fantastic place to stay on the Big Island! We love Bob and Barbara’s Big Island home. We have stayed twice in their unit at Alii Lani when holidaying in Kona and we’ll be back in the future. Bob and Barbara are very professional, helpful and very easy to deal with. Alii Lani is a lovely, well kept and managed complex on Alii Drive. It boasts two lovely pool areas with BBQ’s, and the grounds and gardens are immaculately kept. The 2 bed, 2 bathroom unit is on the second floor overlooking Alii Drive and has a spacious lanai - there is always an interesting parade to enjoy, lovely breezes to catch and beautiful sunsets to amaze! Love the rocking chair to relax in with a good book or to have an afternoon siesta. Bob has a great selection of books in the unit, and there is a library in the common room in the main pool area. Bob and Barbara have thought of everything.Their unit is a home away from home and the hawaiian decor creates a great holiday mood. It has a fully equipped kitchen, great TV’s and entertainment system, good WiFi, A/C, fans in all rooms, and super comfortable beds! Everything is there to enjoy the nearby beaches - snorkeling gear, body boards, beach towels, chairs and a cooler. The location is great! The unit is within walking distance to downtown Kona and close to beaches and shoreline access points. If you have a car and want to explore the Big Island and all its attractions, the major roadways of the island are easily accessible from Alii Lani. Bob and Barbara’s unit is comfortable, convenient, and well located, the perfect place to stay for a fabulous vacation on the Big Island! We stayed here 3 weeks it was AWESOME.. This was our second VBO Holiday in a row in Kona last year we stayed at a different property and hope we are fortunate enough to book this one again, The Condo was Very nicely equiped with everything you can think of for everyday living to entertainment . The Neighbors and property staff very Friendly and informative. I highly recomend this property as long as its not when we want it :)..
My husband and I just stayed in the lovely condo for an extended length of time. We felt like we were home. The owners thought of everything including spices, laundry soap and trash bags. In other VRBO homes we have stayed at, these things have not been provided. One of the very nicest things about this condo is the free wireless Internet and the up graded cable with DVR and on demand. We are definite going to stay here next year for even longer. Alli Lani is the best value you will find on the Big Island. The complex is fairly new, well kept and has two nice pools. This was our second stay there, we all felt that this unit was better than the other unit, and probably one of the best units to rent in the complex. Being a corner unit it has a good size Lanai that overlooks Alli Drive, which is full of activity, yet the unit seems private, probably because it faces away from the rest of the complex and is on the second floor. You can see the ocean in the distance. The units gets a nice breeze in the living room with the sliding doors and front door open. If you have rented condos before you can tell the difference between an investor rented unit and a unit which the owner uses as a second home. This unit is definently set up as the owners second home which makes it a great place to spend an extended vacation. Alii Drive is a seven mile shoreline road which begins at the Kona Pier and ends with beautiful Keahau Bay. There are shoreline accesses all along the way. A variety of beaches provide for all kinds of water activities from surfing to snorkeling and just plain soaking up the sun. Our owner association rules require monthly rentals. We require a $250 deposit to confirm a reservation this is held as a returnable security deposit. The balance is due in two payments: the first is due 60 days prior to arrival date, and the final payment 21 days prior to arrival. My Hawaii Tax ID's are TA-171-359-2320-01 and GE-171-359-2301-01.